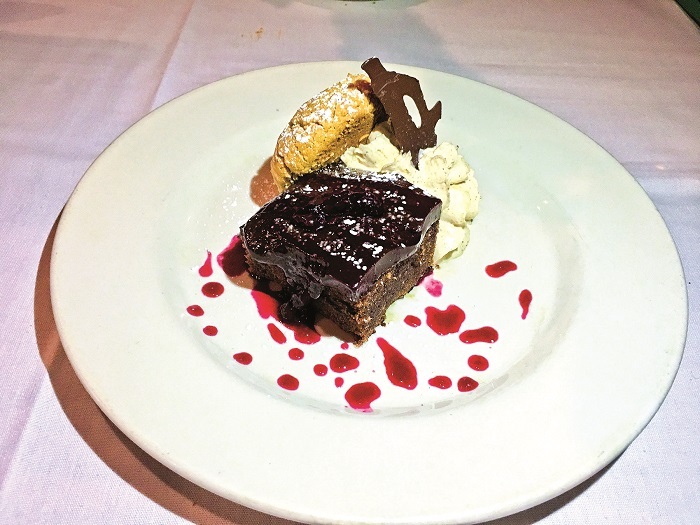 Following a long run in its Marriott Plaza location on Main Street—Reef’s second—the restaurant relocated this December to its third venue in the Deer Valley Club, following a rent spike that the owners felt was unreasonable. 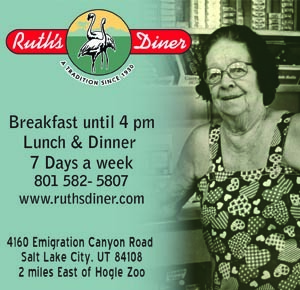 It’s an interesting juxtaposition: a somewhat funky, Middle Eastern eatery situated in a posh Deer Valley lodge. I hope this location works for Reef’s as well as the previous ones have. It’s hard not to root for Asi and Tali’s success; they are extraordinary people and I know of no one who works harder. Hailing from Tel Aviv, and having served in the Israeli Special Forces, the tattooed Asi is no stranger to hard work. 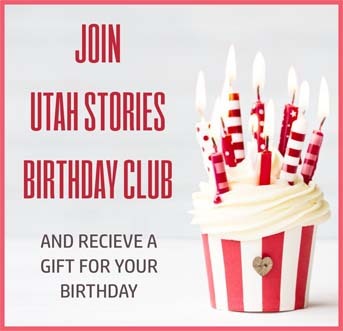 He’s been open about dealing with drug addiction in New York City, and found his first cooking job at Denny’s in Park City. 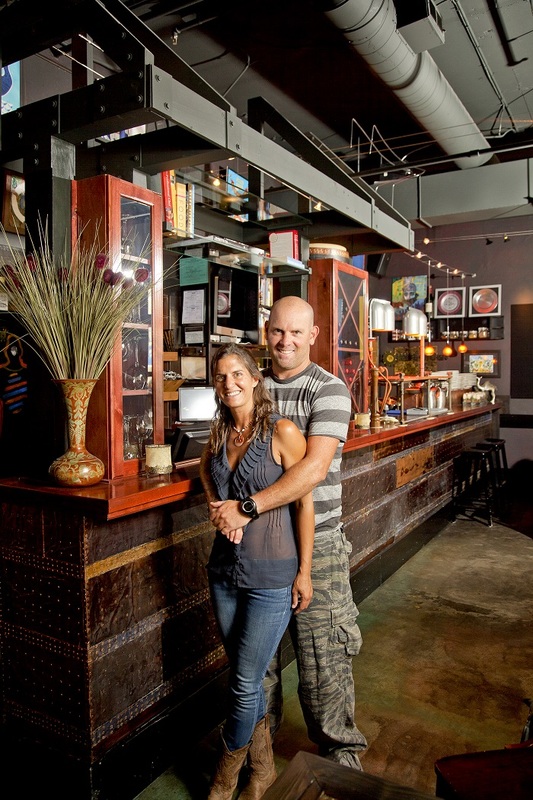 The original Reef’s was born following a successful summer of selling Middle Eastern fare like hummus and pita sandwiches at the Park City farmers market. The vibe at the Deer Valley Club is mid-90s ski lodge, with lots of wood but little character. Local art on the walls helps give the bland-ish dining space some much-needed color splashes. But the real artwork is on the plates at Reef’s. 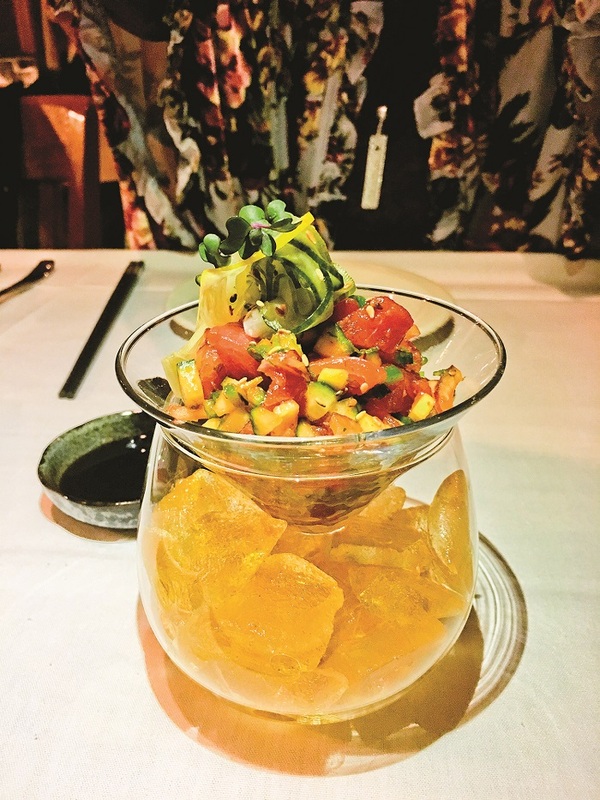 Vibrant, deep-red sushi grade tuna is used for the poke (Hawaiian-style tuna tartare) contrasts with green avocado cubes marinated in a spicy soy sauce and served in a nifty glass with its own ice compartment to keep things cool. Reef’s Poke Tuna. Photos by Ted Scheffler. The poke signals a new direction for the Reef’s menu, which until now has been focused primarily on MIddle Eastern dishes. While those still account for most of the menu selections, sushi, nigiri and sashimi have been added, including a $32 Signature Roll. There’s a Ginger-Teriyaki Fish of the Day (market price) that my wife ordered and loved. 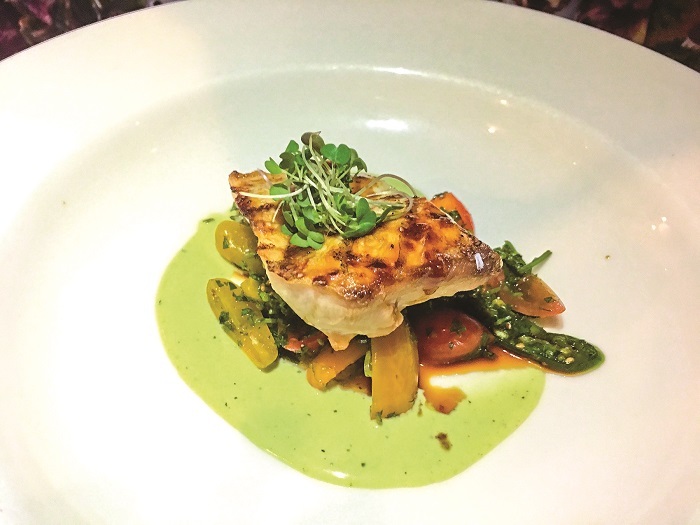 When we visited it was mahi mahi with the aforementioned ginger-teriyaki sauce, heirloom tomatoes and microgreens. 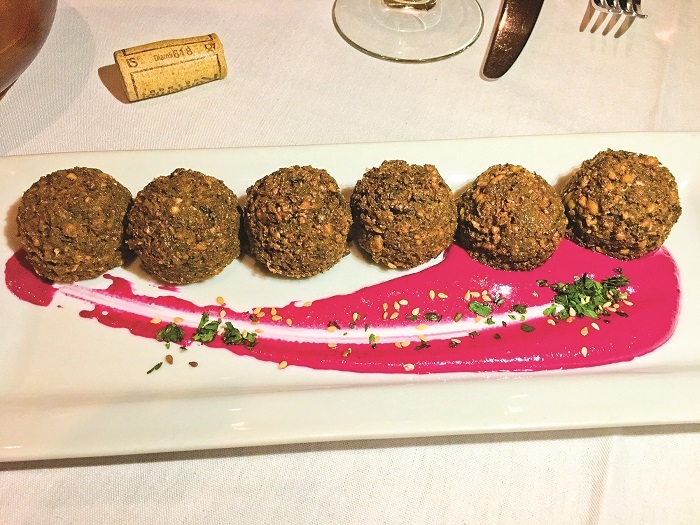 The falafel at Reef’s is a must, and comes with a vibrant, fuschia-colored swoosh on the plate—beet and tahini sauce with sesame seeds and minced cilantro. It’s a dish, like the Israeli salad, hummus, baba ghanouj and sesame-cabbage salad, that are mainstays of Reef’s Middle East-oriented menu. One of the more popular dishes over the years at Reef’s has been Asi’s chicken schnitzel. In the past, it was a traditional German/Austrian type schnitzel. 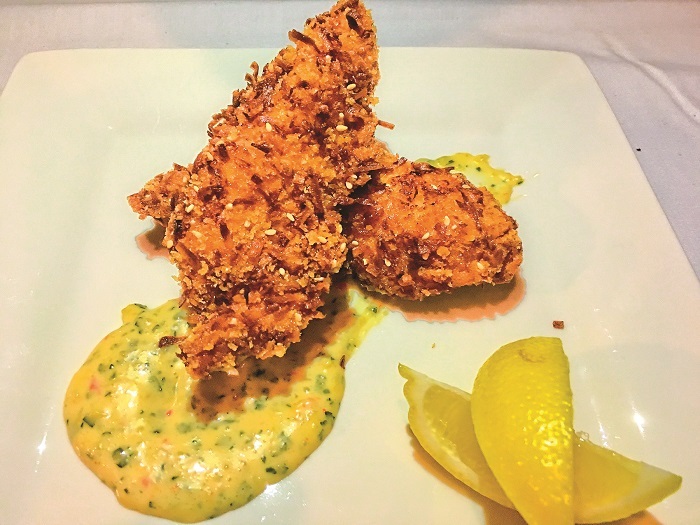 On the new menu, it’s been updated a bit and now the boneless breast meat is coated and fried in a coconut-sesame breading which lends it a slightly sweet taste. This schnitzel rendition is known as schitzelonim—a sort of Israeli version of chicken fingers, albeit a very elevated one. I have to say, however, that for the $24 price tag, I expected a side dish with my schnitzel. But alas, it came simply with sauce and a couple of lemon wedges. We were going to pass on dessert, but Tali insisted that we indulge (gratis), and boy am I glad we did! Rich, dense, flourless chocolate olive oil cake was stupendous, as was the homemade halvah, a flaky tahini/sesame-based sort of candy cookie that, alone, is worth a trip to Deer Valley. It will be interesting to see how Reef’s fares in posh Deer Valley. I suspect that visitors and locals alike will welcome Asi’s eclectic new menu. Here’s hoping that, as the saying goes, the third time’s a charm.